Russian Prime Minister Vladimir Putin has dismissed calls for a review of disputed parliamentary election results and has accused protesters of lacking clear aims. He was speaking to his supporters in the All Russia People's Front. His comments follow the latest mass protests on Saturday over the 4 December poll, which his opponents say was rigged. 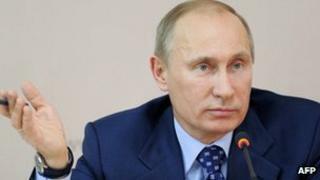 Mr Putin is the front runner in presidential elections due in March. He said he needed "no tricks" and would win support fairly, adding that his opponents were using the parliamentary vote to try to create instability. "The elections are over. The parliament has started its work and a speaker has been elected," Mr Putin said. "There can be no talk of any review. "There is only one way prescribed by law - an appeal to court," he said. The outcome of the disputed vote has galvanised opposition to the Russian leadership and has prompted a series of street protests attended by tens of thousands of people in several Russian cities. The demonstrations have been the biggest challenge yet to Mr Putin's authority, and that of President Dmitry Medvedev. However, Mr Putin dismissed the protest movement. "The problem is that they have no single programme," he said. "They have many individual programmes, but no unified one and no clear way to reach their goals, which are also not clear." Official results from the parliamentary vote gave Mr Putin's party just under 50% of the vote, down sharply from 64% at the previous election in 2007. Observers from the Organisation for Security and Co-operation in Europe (OSCE) said the polls were slanted in favour of the pro-Kremlin party United Russia. They reported apparent manipulations such as the stuffing of ballot boxes and said the election administration "lacked independence". The Russian authorities were also criticised for banning several opposition parties. The protesters have called for a re-run of the vote, a demand rejected by the Kremlin. President Medvedev announced political reforms last week, but many demonstrators said they did not go far enough. Mr Medvedev is not standing for another term as president and will make way for Mr Putin who previously held the post between 2000 and 2008. Mr Putin remains popular with many Russians and until recently a presidential victory had appeared all but certain. However, correspondents say the protests have made him look more vulnerable.